When I started out to write this blog post I intended to write a list of all the reasons I'm proud/love to be an American, but upon quick review I realized this list was much too long to compile. However, I did find one common theme to everything: freedom. I think we often forget how lucky we are to have the freedoms that we do in this country because for most of us we've never experienced anything else. This is what July 4th is really about. This core belief that our country is founded upon is so often lost amongst the sea of red, white, and blue ridiculousness of the day. 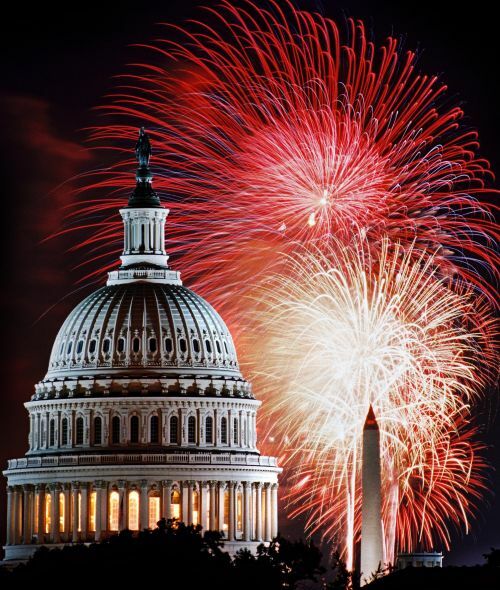 I spent July 4, 2011 in DC and saw the fireworks on the National Mall in person, but of course I can't find one of my pictures so I had to borrow this one. So today I challenge everyone to truly be thankful for the freedom to go out on the lake, BBQ in your back yard, drink too much beer, watch fireworks, or whatever your 4th of July tradition is, because there are so many countries around the world where you aren't allowed to do any of that. Also say a prayer that all those who risk their lives to protect our freedoms stay safe.